Be the first to share your favorite memory, photo or story of "Pepper" Terry. This memorial page is dedicated for family, friends and future generations to celebrate the life of their loved one. 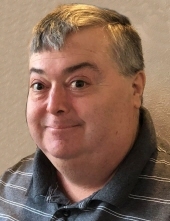 “Pepper” Terry W. Wenger, age 61, passed away on Sunday, October 21, 2018. He was born in Hartford on June 1, 1957 to parents William and Mae (Jochem) Wenger. Terry was a 1975 graduate of Hartford Union High School, where he was active in managing the basketball and baseball teams. After graduation he worked at International Stamping until the closing of Midas in 2006. Terry was an avid Badger fan, he enjoyed spending time at his home on Lake Sinissippi. His greatest enjoyment was spending time with his niece and nephew. He enjoyed sharing stories and laughter with Cody. Terry was proud of keeping his promise that he would be around for Melissa’s wedding. Terry is survived by his sister, Heidi (Steve) Scharrer; niece, Melissa (Kyle) Pruess; nephew, Cody; aunt, Gertrude “Toots” Cundy; also survived by cousins, other relatives and friends. Terry is preceded in death by his parents; nephew, Timothy Scharrer. Private burial at Pleasant Hill Cemetery. A celebration of Pepper’s life will be held at a later date. To send flowers or a remembrance gift to the family of "Pepper" Terry W. Wenger, please visit our Tribute Store. "Email Address" would like to share the life celebration of "Pepper" Terry W. Wenger. Click on the "link" to go to share a favorite memory or leave a condolence message for the family.